But within a presidential system, gridlock leads to a constitutional trainwreck with no resolution. And, the more ideologically polarized our government becomes—assuming it is possible for it to get more ideologically polarized—the more often we will see gridlock leading to one constitutional trainwreck, as Yglesias puts it, after another. Conservative Republicans faced with a liberal, Democratic Senate and a Democratic President begin using the filibuster to not just block the President and majority party on the big issues but on just about every piece of legislation and every Presidential appointment. Not getting their way, they threaten to even shut down the government completely. As Yglesias notes, the Republicans weren’t doing anything illegal or unconstitutional, but what they were doing was “in its intent and its scope, unprecedented.” The same could be said for Obama’s counter moves. As relations with Congress have worsened, the Obama administration has set about expanding executive authority over domestic policy to match Bush-era unilateralism in the national security domain. This came to the fore most publicly with Obama's decision to protect millions of unauthorized migrants from deportation without congressional agreement. Again, in spite of what you hear from Republicans and Fox News, there was nothing illegal or unconstitutional about what Obama was doing, what he has said he felt he had to do to get something done in Washington. However, it is unprecedented. Yglesia sees no hope that things will get better. Congressional districts are now, for the most part, gerrymandered by Republican state legislatures to ensure that the House of Representatives will be filled with Republicans with extremely Conservative views facing a minority Democratic caucus with less extreme but decidedly liberal views. Today the divide in the House is so great along ideological lines that, as someone said, the most liberal House Republican is far more conservative than the most conservative House Democrat. 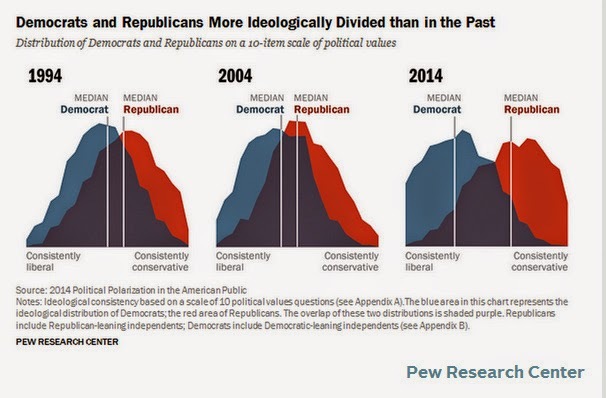 There is almost no overlap between the two parties, at least in the House and this ideological divide continues to increase in the Senate as it does among the American public in general. Consider these charts prepared by Pew Research. Could A Dictatorship Be in Our Future? Matthews doesn’t think that either scenario is very likely for a long time, perhaps ever. However, it could happen. That’s disturbing. Matthews thinks it is time for us to begin thinking about a new and more workable and lasting parliamentarian form of government. Why not? We did it before in 1788.